This is my second year taking part in Reaper’s “12 Days of Reaper” promotion where they have limited time Christmas miniatures and special one day only releases that you can get if you spend $35 in an order. This year I ordered four times, picking up a Sorceress, a second Christmas Elf (I painted one last year), a twofer in Naughty and Nice and of course, the Christmas Dragon. One of the limited pieces for this month only is the second in the Christmas Knight set (get the pun?). 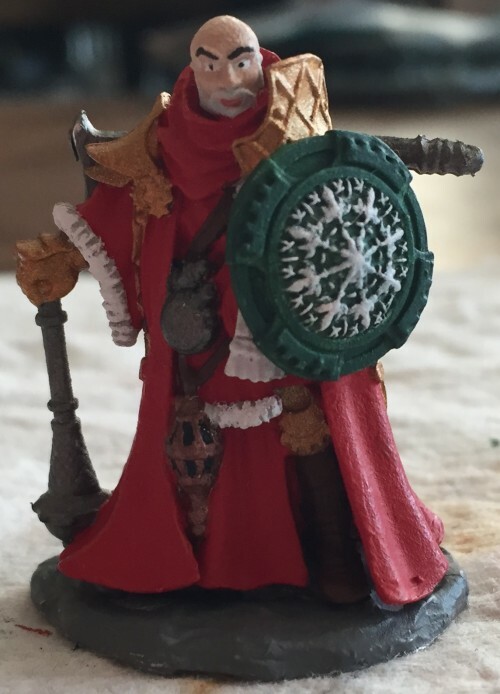 Last I picked up and painted the original Christmas Knight, but I was just learning to paint back then and looking back on that review, I was NOT very good. Of course it was my first time painting a metal figure, and this year, thanks to the Batman Miniature Game and other pieces, I’ve painted well over a hundred metal miniatures since then. I was hoping that the paint job quality on last year’s figure would not repeat itself. So now that I have Sir Ulther in hand (and a second original Christmas Knight as a do-over), was it a piece I could recommend? Well, yes and no. 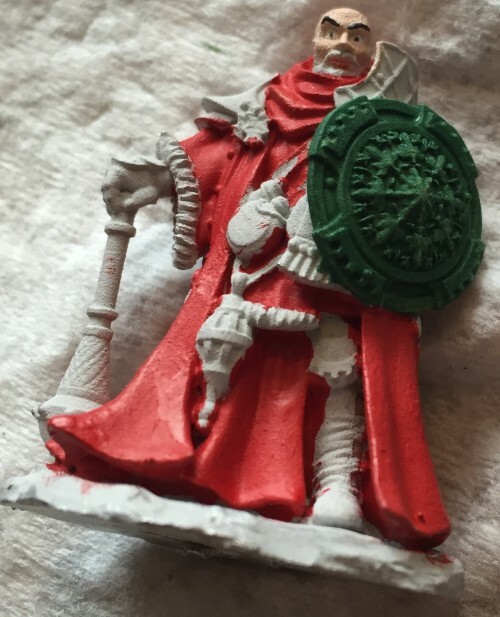 First of all the piece is EXTREMELY BUSY to the point where there’s just too much on him for a 25mm character. As well, because Sir Ulther is all one piece, there are a lot of nooks and crannies that are extremely hard to reach, even with a 10/0 brush. This means you have to choose between spot of primer left in tiny crevices that you can see, ruining the overall paint job, or getting a big blob of paint into those areas to reach them, knowing full well that means a lot of touch ups down the road. It’s definitely not a piece I would recommend for a beginner and had I tried him last year, I would have probably gone insane. Even this year with a lot more experience under my belt, this figure was frustrating at times, so I can’t really recommend him unless you are a pretty top notch painter. The sculpt is excellent, mind you. It just doesn’t translate well into painting fun. Let’s take a look at the piece from beginning to end. 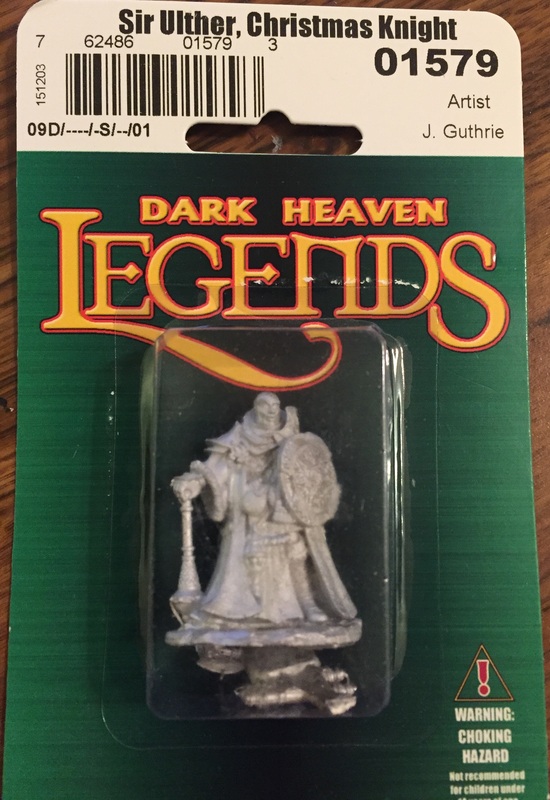 Here is Sir Ulther in his Reaper blister packaging. He was expensive, but as a figure that is only available for a limited time, it makes sense. He’s pretty unimposing in his naked metal form though. 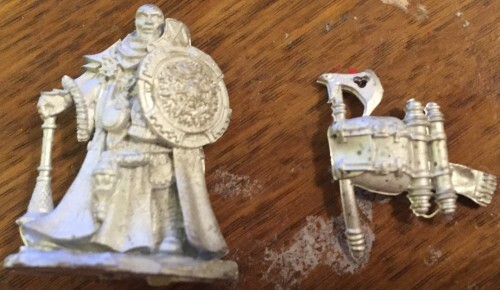 Here is Sir Ulther removed from the packaging. 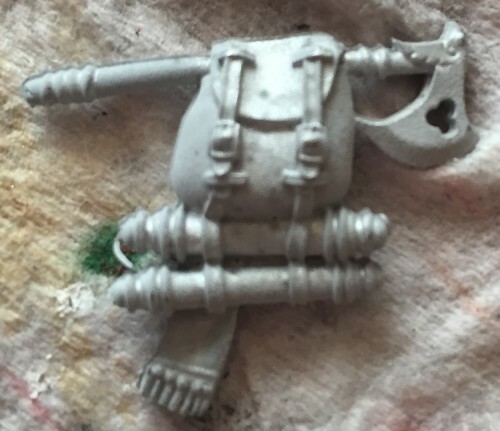 As you can see, he comes in two parts – the main character and the backpack. 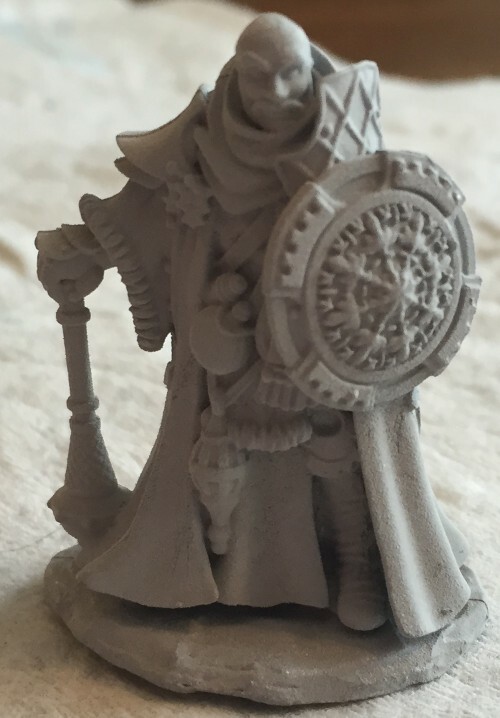 From this closeup, you can easily see how much STUFF there is on this figure and how the robe and Sir Ulther’s many items make for a lot of extremely tiny areas to reach. Again, this made Sir Ulther…not fun at times. 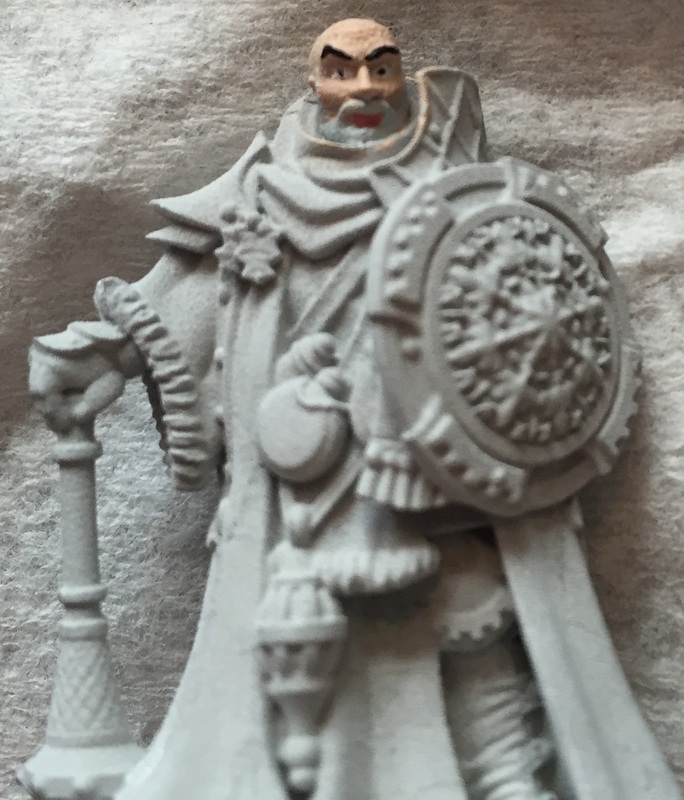 Here is Sir Ulther primed. I went with a white primer because I really wanted him to be bright and colorful. Black primer dulls the colors when it is used and for a Christmas piece, that just isn’t what I wanted. I decided to start with the face, which is pretty typical for me. Eyes are the hardest part on a figure for me to paint, so I like to really work on them first as sometimes, the face can take me as long as the rest of the mini. To really highlight this, Sir Ulther ended up using 15 different paints, not count shading, thinning and the like. SIX of those paints alone were for the face. Skin tone was Reaper’s Fair Skin and then shadowing was with Fair Shadow. Pretty obvious choices, right? The eyes were Citadel’s Scar White with Rhinox Hide for the pupils and eyebrows. The lips were Reaper’s Old West Rose and I did the beard with Citadel’s Ulthan Grey, which is a grey/off-white and looks perfect for beard (especially if you have a Dwarven army). The end result looks a LOT like Sean Connery to me. Thankfully, it wasn’t just me as several other people I showed pictured of the completed Sir Ulther too, made the same comment. So hurrah, Juan Sánchez Villa-Lobos Ramírez is back – in Christmas form! Now it is time for basecoating the rest of the figure. Since this is a Christmas Knight, I wanted to make sure I used Christmas colors. Citadel’s Evil Sunz Scarlet for the robe and Reaper’s Christmas Wreath for the green shield. Pretty cut and dry. Now to finish the shield and do the metallic. 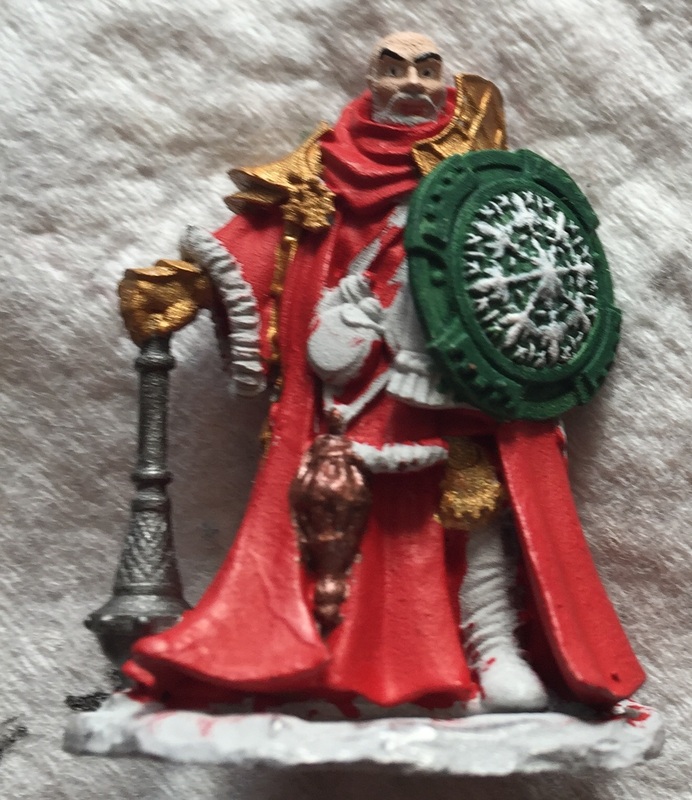 I did a very light drybrush dusting with Citadel’s White Scar for the snowflake on the shield and I could have hoped for it to look any better. I think if you tried to do anything but drybrush the shield, you would be in for a world of frustration. Just make sure you have barely any paint on the brush and go over it lightly. I did this six or seven times to ensure I got all the spots needed. Then I went with Brass Scorpion for the Censer, Leadbelcher for the mace and Retributor Armour for the armor on Sir Ulther. All three colors are Citadel paints BTW. Again, I really tried to keep with Christmas colors, which is why the armor is gold instead of silver/steel, like you’d see on most knights. The Fleur de Lis tassels were also done in gold. Now it’s time to start filling everything else in. The censer’s impressions were done in Abaddon Black. 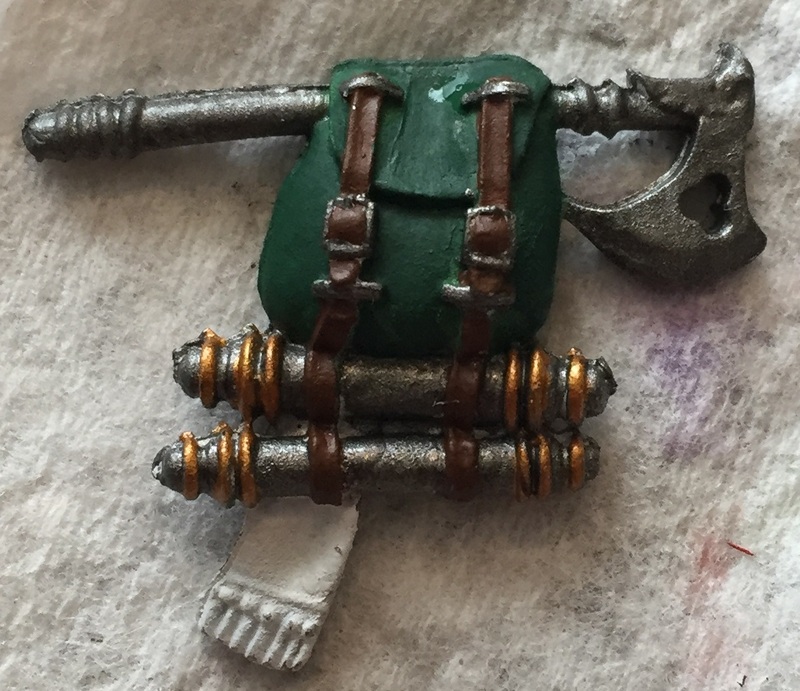 The boots and leather straps were done with Mournfang Brown. 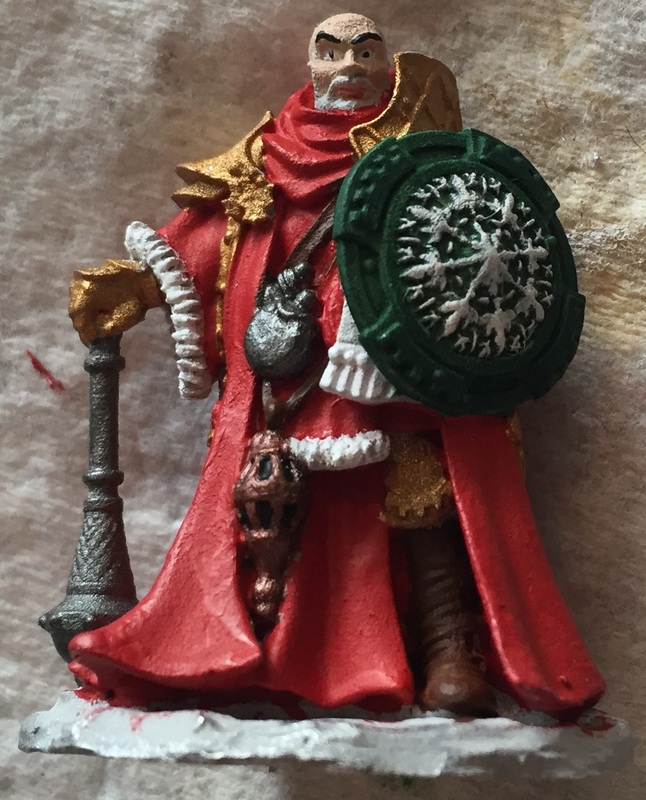 The canteens were done with more Leadbelcher and the scarf and robe trim were done in Ceramic White, so they stood out from the white on Sir Ulther’s snowflake shield. Remember that backpack from the beginning of this piece? Well here it is again, although now it is primed in white. Although smaller, it was also a lot easier to paint than the primary piece of this figure. 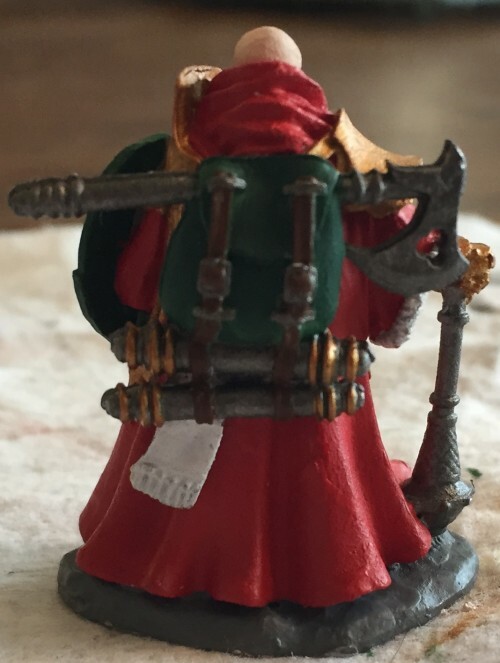 Here is the backpack all painted up. Christmas Wreath was the primary color here. The straps are Mourngan brown. The buckles, scroll cases and axe are all Leadbelcher and the rings of the scroll cases are Retributor Armour. The scarf is ceramic white. Honestly, I could have chosen some new colors, but Sir Ulther already used SO MANY that I wanted to keep to what I already used. I feel it came out really nicely too. Here’s the back of the completed Sir Ulther. You can see I’ve done touch ups on everything and also painted the base in a grey called Dawnstone. Here’s the finished Sir Ulther. While not my best work, he came out pretty decently and he looks a lot better than the job I did on last year’s Christmas Knight (who I think is the better choice of the two.) It’s a very colorful and striking piece and I really love the shield and the face. The rest of the figure is okay, but not great is design or in terms of my paint job. For $9.99, he’s pricey and a lot of work. It’s up to you if he’s worth it. He’s still available until the end of the month, so grab him if you want him!